Darrel Cadman Pilot Mountain Turquoise Bracelet size 6 3/8"
This is a very fine stone of natural, untreated Pilot Mountain turquoise from Nevada. We see fewer and fewer of such fine Pilot Mountain stones as time goes by and stocks become depleted. Polished to glassy smoothness, this perfect oval stone shows gorgeous color and matrix. 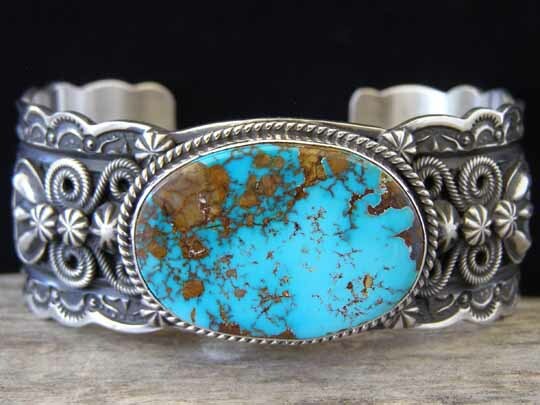 Set in a deep-stamped, scalloped-edge cuff by Navajo silversmith Darrel Cadman, this stone is framed by scrollwork, starred buttons and "bumped up" appliqueés. Beautifully precise, deep stampwork decorates the cuff to the terminals and the cuff was oxidized to heighten the visual texture of the piece. This is exquisitely made to Darrel's exacting standards and holds a superior stone of fine natural Nevada turquoise. Hallmarked D. Cadman with a ram's head and stamped Sterling inside the cuff. Stone: 1 5/16" x 15/16"